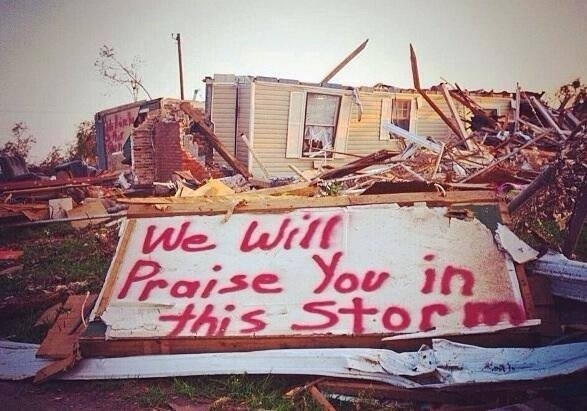 The words of a mother who lost her 9 and 7 year old boys in the tornadoes last week in Arkansas. THEIR STORY is a must read! Thanks to Stephen Jones for sharing this story! Waiting for what God’s put on your heart isn’t easy, but giving up can be even harder. Think Abraham. Promised a son. Promised a nation, in fact. After many years he gets impatient. The enemy gets into his head. He stops trusting God and uses what we’d probably call reasonable human logic to solve the problem. He starts thinking for God. Rationalizing. He gets lost in the pain and desperation of his circumstances. Waiting, from our vantage point, often seems as if nothing’s happening. But God is always working in the situation and in us! We either believe that or we don’t. We either trust him or we don’t. God’s timing isn’t just good, it’s perfect. Our knowledge is limited. Our perspective is often that of a blind man with an elephants tail in his hand trying to describe the animal he’s holding. God has the entire picture in his view. We wait and trust for our Isaac or we end up with an Ishmael.